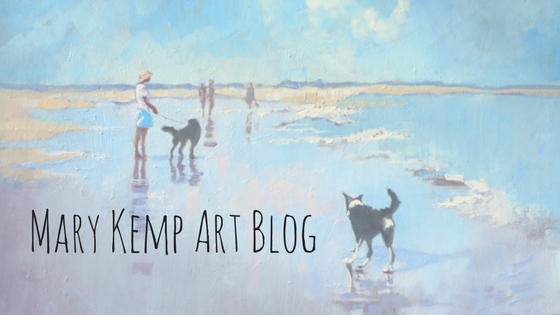 The art blog of Mary Kemp Impressionist artist, painter of the seaside, sometimes with families and dogs, especially border collies. 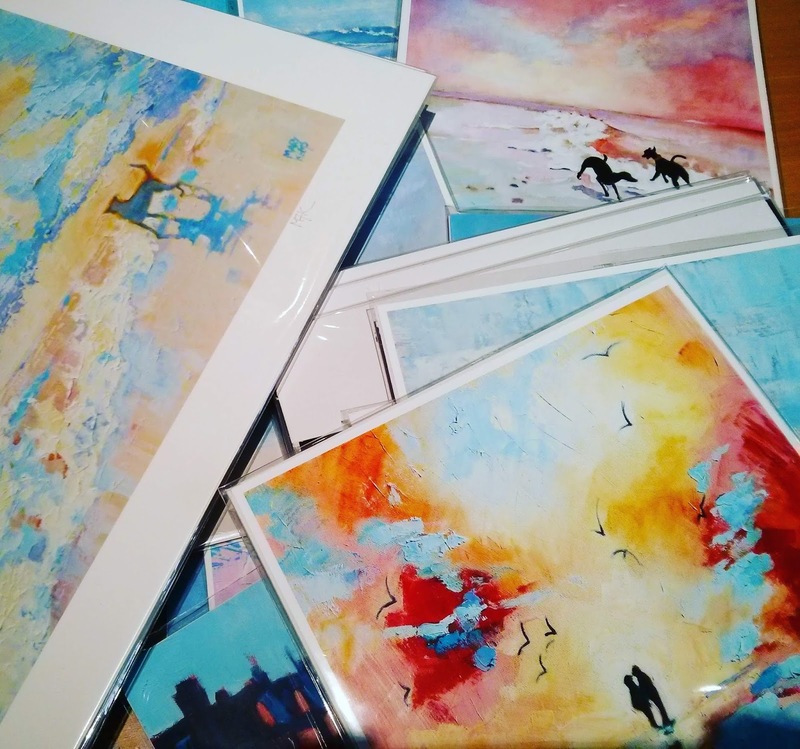 I'm often asked by busy customers how to look after their prints once they've bought them. Prints are a great way to enjoy art for not a lot of money, and cared for properly a print will look just as good decades down the line as it does today. Advances in technology have meant that inks and paper are much more stable than they used to be. This doesn't mean that you can mistreat your print any more than you could before, but it does mean that given good conditions it will last longer. There are four main enemies out there, dust and rogue particles, light, moisture and bad chemicals, and of course the aim is to avoid these. Not keeping your print in the kitchen or bathroom or any other steamy atmosphere. Ensuring the surfaces that are in direct contact with your print are acid free. Most modern framing materials will be. Check recycled frames. Old hardboard can be a problem. Choose a frame and mount you love.💖 Why should you let fashion dictate your choices? unless it's fashion you love. It's a good idea to have a mount round your print. This serves to keep it from directly resting on the glass. Attach the print to the top back surface of the mount so the print hangs behind the mount, anchoring only the top edge. This way the print won't crinkle as it accommodates changes in moisture and temperature in the atmosphere. The tape you use is important. Don't use sellotape. Framer's tape or even masking tape are better. Next put the mount in the frame, cleaning the glass well, and seal the back of the frame, with tape so nothing can get in. You'd be surprised how dust and tiny thunder flies can penetrate. So it's all ready to hang. Remember the cord on the back, strong nylon cord, tied with a proper knot. One of the most embarrassing things that happened in our house was a picture falling off the wall in the middle of the night. It hit the burglar alarm box, setting off the alarm and waking up the whole street. We were not popular! It was a lesson painfully learned. 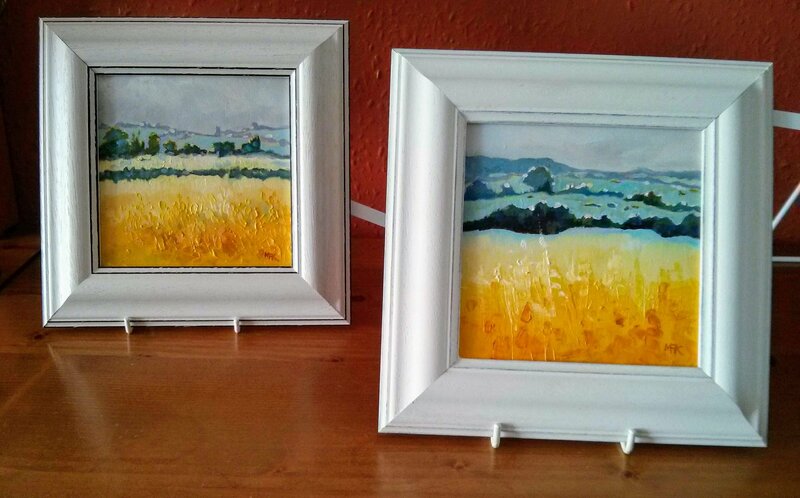 If the diy option is not for you visit a local picture framer. It might not be as cheap but this is the bespoke option, and you will be guided through your choices by an expert. 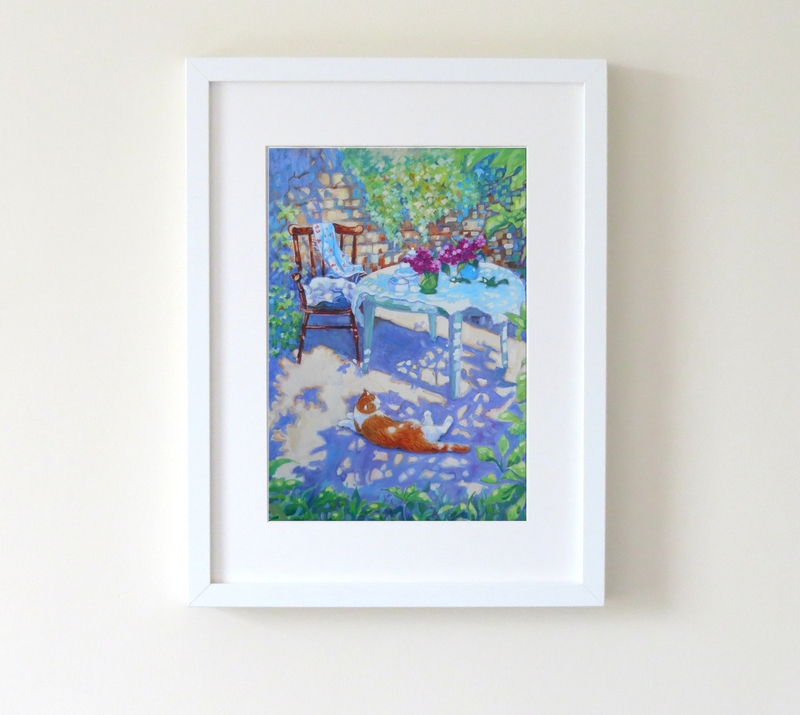 So diy or bespoke I hope I've given you a few tips about how to care for your prints. 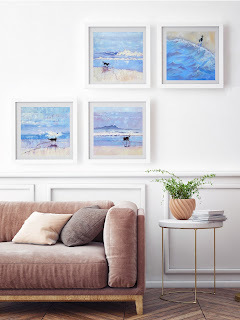 The prints in this article can be found in my Etsy shops, MaryKempStudio and Mary Kemp Art . On Boxing Day, just as I was clearing up after a splendid lunch party, full of good cheer and too much food, there was a little notification on my phone saying that one of the paintings I thought was really rather good had sold. 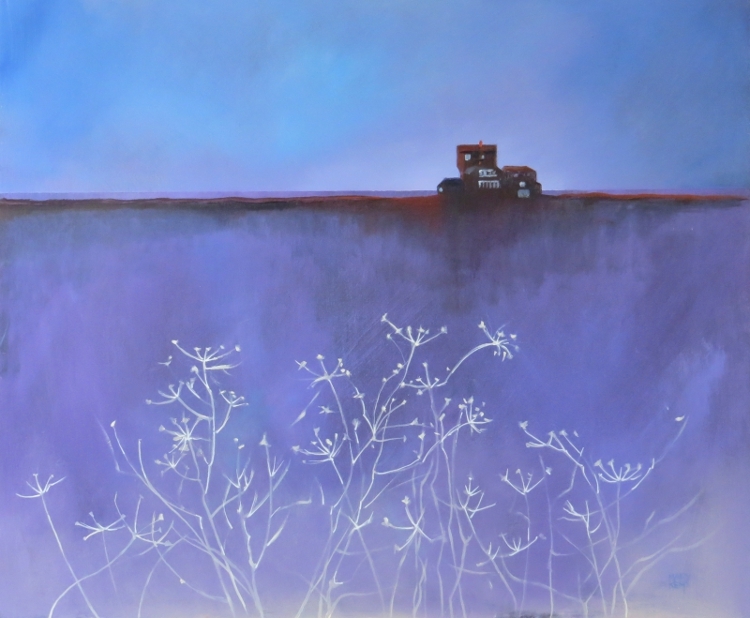 I'm always glad when a painting finds a new home, and it seemed a fitting end to a very happy day. It went, via Royal Mail special delivery, all the way to Scotland. where I've seen seas just like this. Here is the sea at it's most enigmatic, brooding, not violent, but not hospitable. 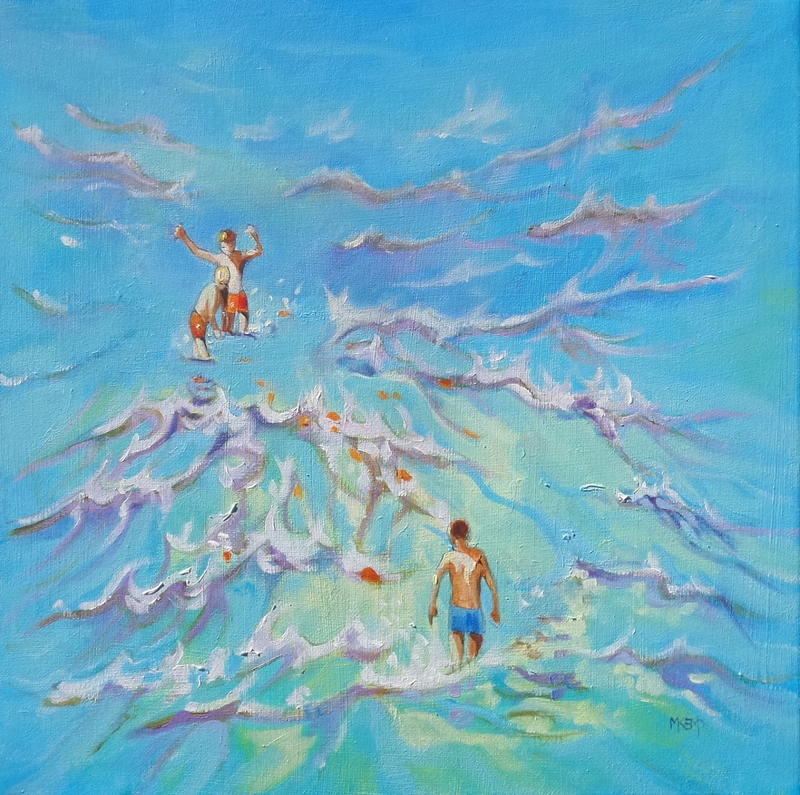 Because today is so rainy and cold I thought I would post a painting that came from a warm holiday in the Canaries. Just looking at the deep blue sea transports me to another place. I can imagine the warm sun on my arms and see the blue of my favourite t-shirt (most of my t-shirts are blue). I can hear the children talking on the edge of the concrete jetty at Los Gigantes and hear the sea pounding backwards and forwards against the rocks. 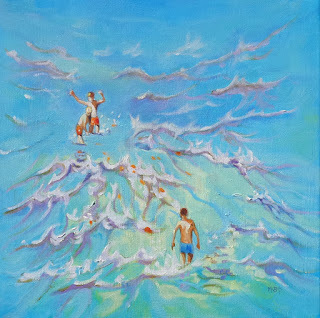 This is an oil painting on natural linen canvas. It's one of three paintings from that trip. Oh why do I do it????? Have I got the dates right? Do I know the time? Am I appropriately dressed? !!!!! Will it be hot? Will it be cold? MOST IMPORTANT. Where are the loos? Is there enough change in the box? Hope there's someone nice next to me. Have I got my glasses? Worse still what if lots of people come and no-one buys from me? Have I packed the sellotape, blue tac, pens, business cards........packaging, bags..........? Have I told everyone I know? Should I have a glass of wine tonight? Will it prevent me sleeping? Is it possible to smile ALL DAY if you're grumpy at heart? What if my work's not up to scratch? Are my prices too high? TOO LOW??? Will anyone love my prints? Will I frighten people away? Am I too friendly? too aggressive? What's for supper when we get home? Pizza and baked beans eaten in front of Saturday night telly with the one I love. 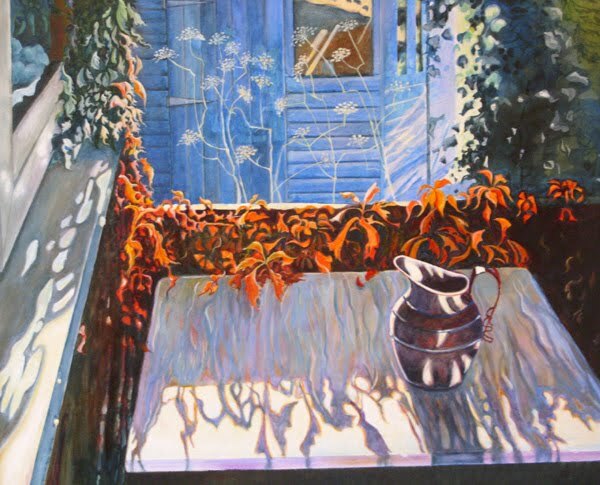 I wrote this on the eve of Peterborough Artists' Open Studios Affordable Art Fair. It's been a while since I've taken part in such an event. We used to do them regularly, locally and up and down the country, but I must admit I've been seduced a bit by the internet of late and stay at home in the warm. My muscles may be atrophying from not carrying all those heavy boxes but my weekends are a lot calmer. 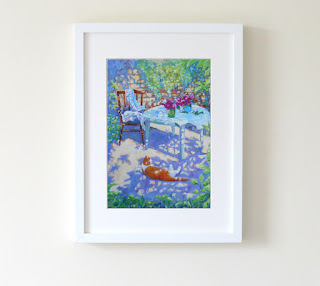 And if you'd like to see more of my prints check out my Etsy store , the reason I don't do many art fairs anymore. Days in the Studio as Christmas Approaches. This time of year as Christmas approaches I struggle with light levels in grey old England. I can't imagine how those in the land of the midnight sun fair over winter. It fills me with a whisper of glumness that sneaks into my days and settles in my lap at about tea time. I long for the summer to come along and wake me up with bright sunlight. 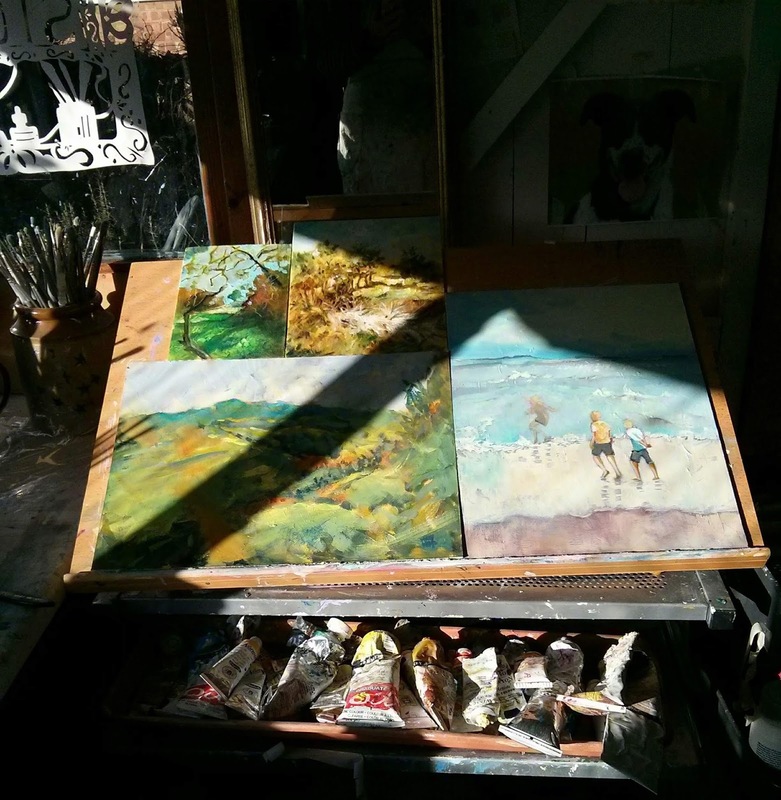 My studio suffers from light inconsistencies this time of year. I may moan about low light levels but when the sun does shine it ricochets in through the window straight across the painting I'm working on, splashing light and shadows everywhere making it hard to judge colour and tone. So I put up paper blinds on the window (I find the thin paper that comes between the sheets of glass for my husbands picture framing business ideal for that) and get a lovely diffused light. 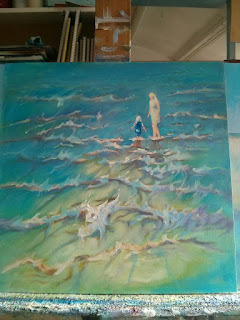 Then the sun goes in and my studio is plunged into an underwater world, leading to blinds up and lights on. 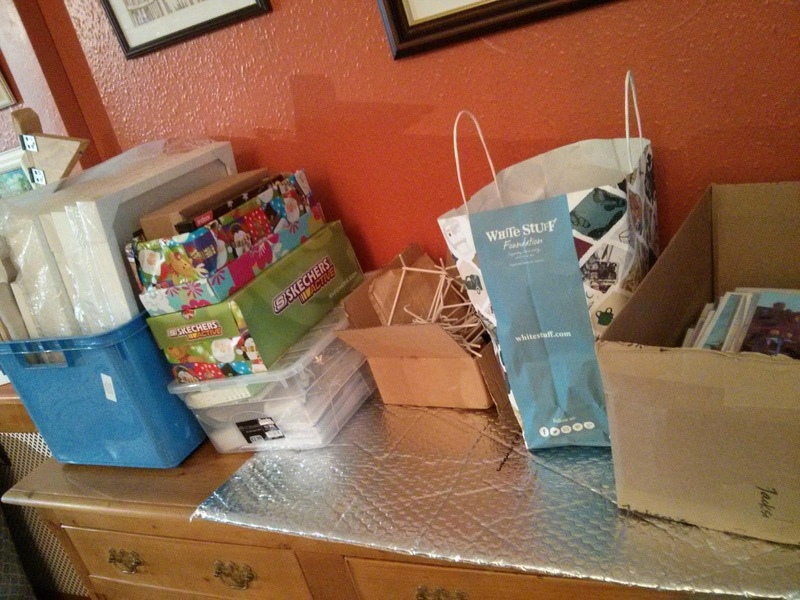 I'm amazed how I actually get any work done with all this housekeeping. 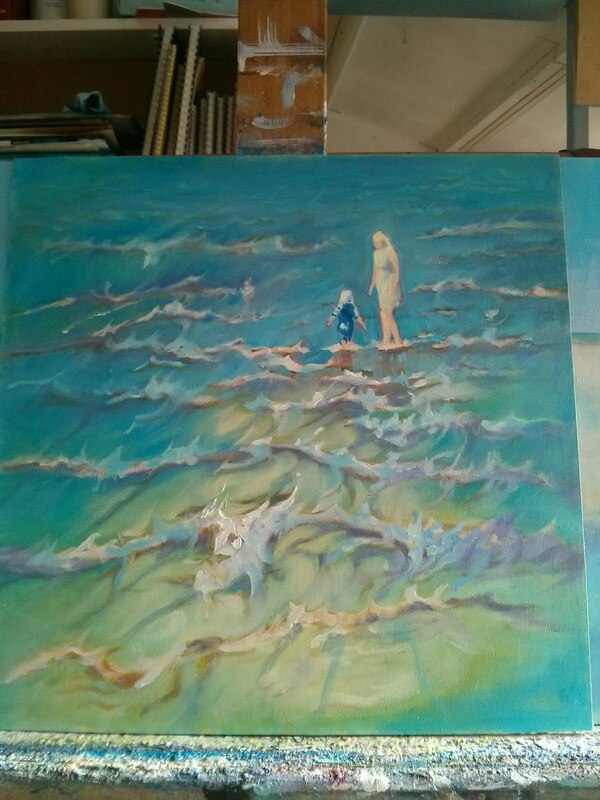 I'm working on a few things at the moment, exploring landscape and seascape, finding them as often as not peopled by those I know. I have a lot of material from summer to draw upon, saved up for the time of year when I don't want to be out and about. 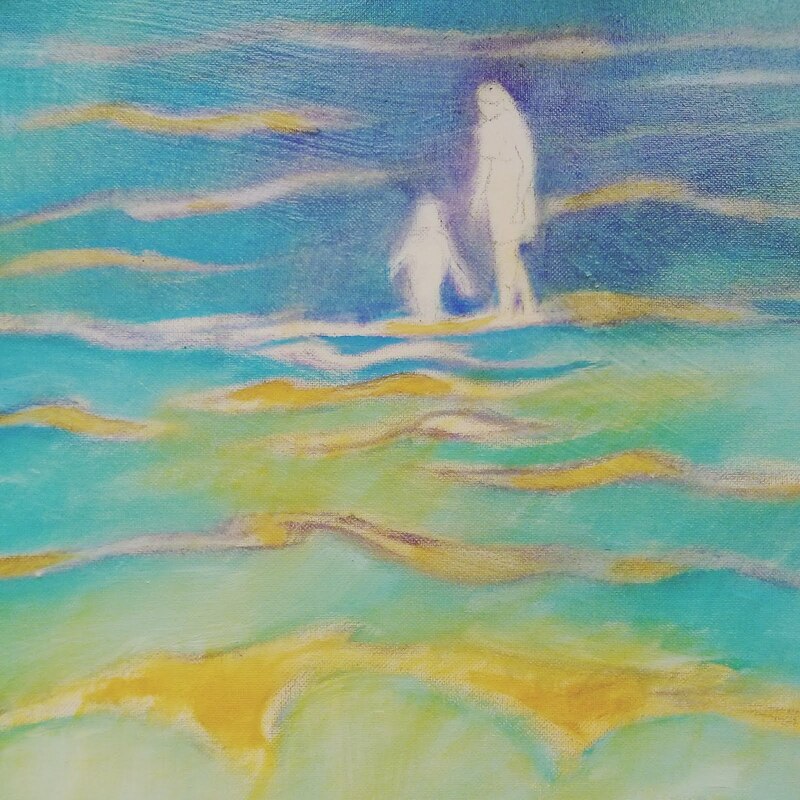 Memories, watercolour sketches , line drawings and photos. I installed daylight bulbs in the studio so there's no excuse. I've just got to get on with it! We're getting excited about Christmas. They tell me I need a cyber sale! So I'm sharing it with you. It's only on for a short time. Tuesday 20th to Monday 26th November. Here's some of what you'll see. 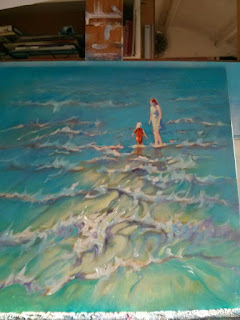 And some very special seaside paintings! 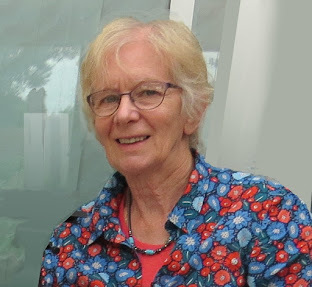 Copyright © 2018 Mary Kemp, All rights reserved. Today I'm sharing with you the bittersweet inspiration for a series of paintings I've rather grimly called "Long Lost Days" which keeps growing and growing as I add to it. They've come about from the fact that I was sort of sad when my children grew up and left home. Not that I didn't want them to fly the nest. But, you know, no matter how much your brain tells you it's the way it should be and you've done a great job, your heart feels a little bit empty. Like most parents I'd been so busy battling through the everyday that I hadn't realised how precious those days were until they were gone. Now I realise that part of my life is behind me. I still see my children and their families often but I am a bit player instead of the main protagonist. And with that comes great benefits! But one of the great advantages of this state is that now I can truly observe life because I am no longer on duty. 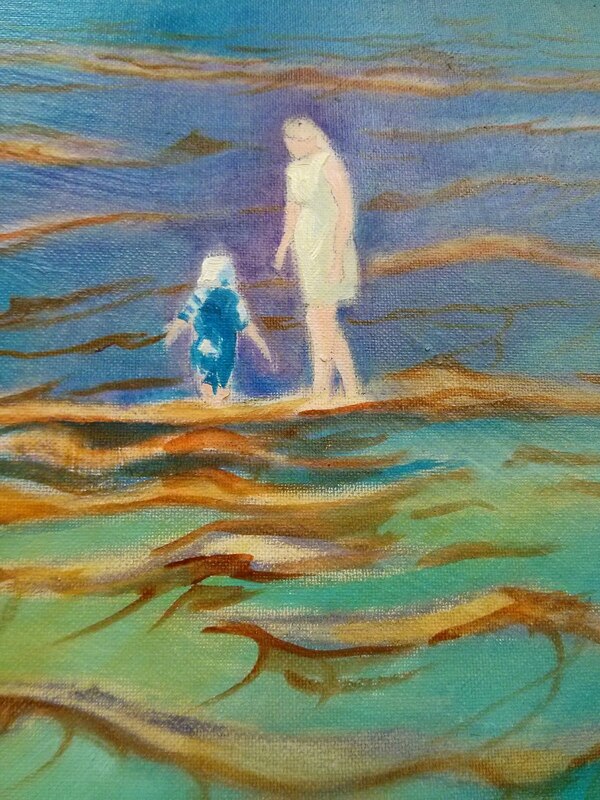 When my children were little I ached to paint them, incorporate them into my paintings. Now it's my grandchildren who take their places, and some look so like their parents. I've been painting this current series of paintings for about 2 years now, and it took me a while to realise that they were really scenes from the past, not the present day. I suppose it is my way of adjusting to circumstances. 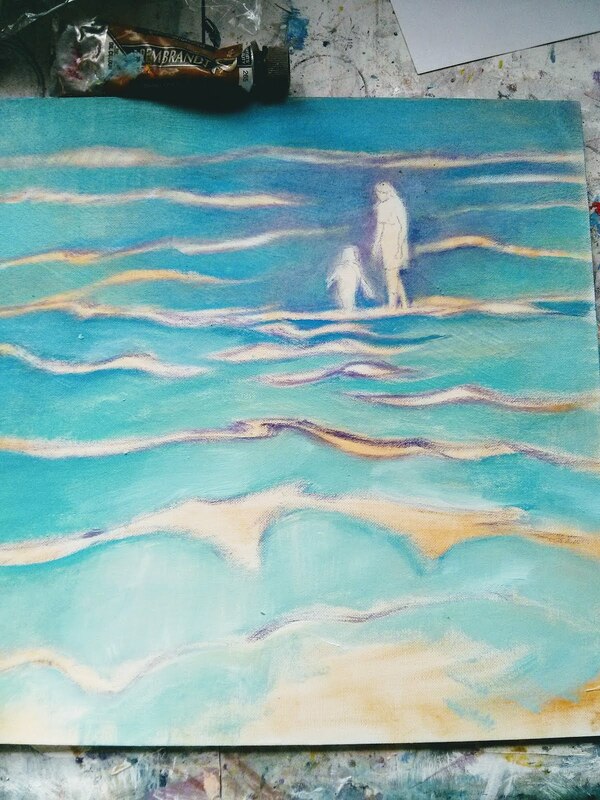 I called this series "Long Lost Days" but I think it's a bit maudlin so I have settled for " Beach Paintings" for the time being. 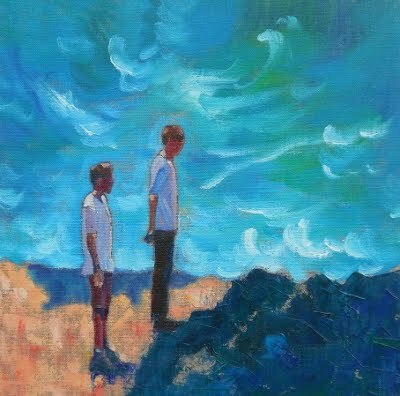 The series has grown and grown, scenes and couples added to it, so much so I've created a whole new shop for it on Etsy, and included some of the paintings as prints. Here's the link! and here too. And especially for you is a discount code . Just type in SEASIDEFRIENDS at checkout for a 15% discount. Every Painting Tells a Story. 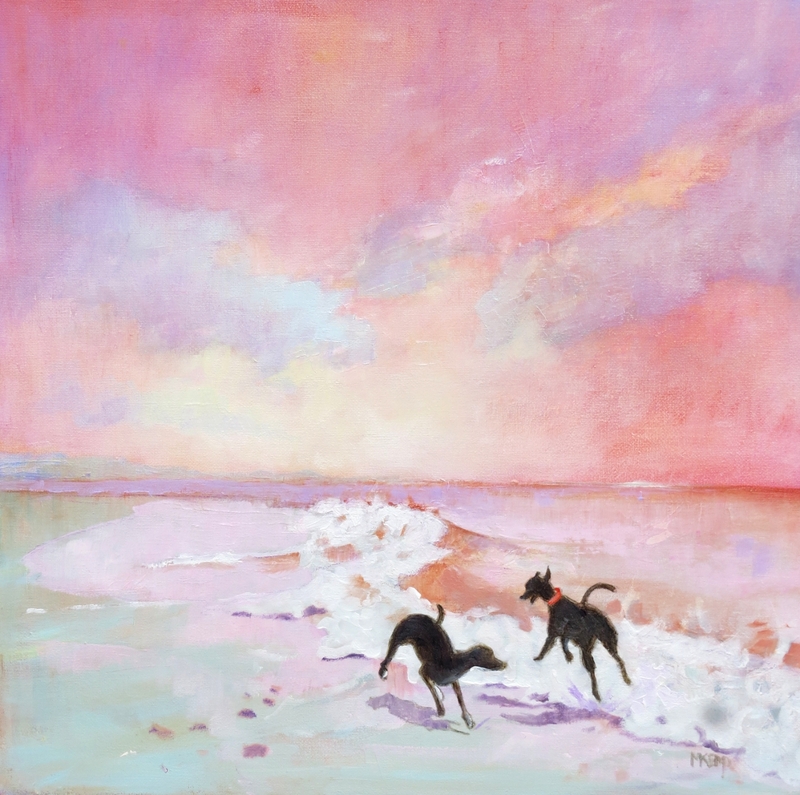 "Two Whippets Playing in the Surf"
I'm sure you'll agree with me that an artwork is not solely a collection of colours and shapes. It's so much more than that. 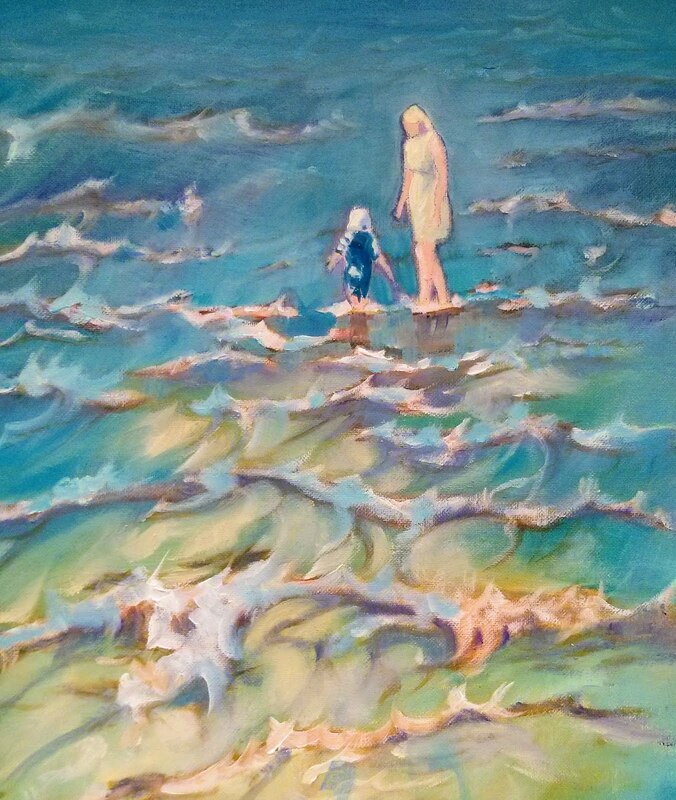 There's usually a bit of a story behind every painting and I thought you might like to hear how this particular painting came about. We'd visited the beach on a Wednesday. It was quiet, not many people about and all the children at school. The beach belonged to the dog walkers and those with time to dawdle, like us. 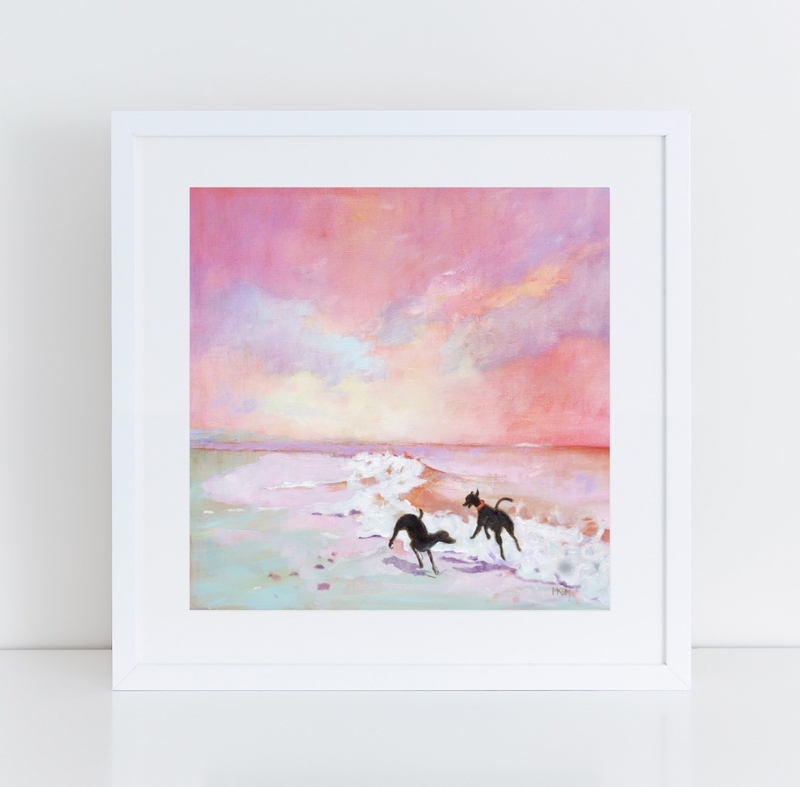 On the sand that particular day were two dark brown whippets frolicking in the sea under a blushing pink sky. 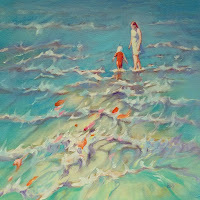 They reminded me of children racing in and out of the waves. There are no children with me on a daily basis any more. 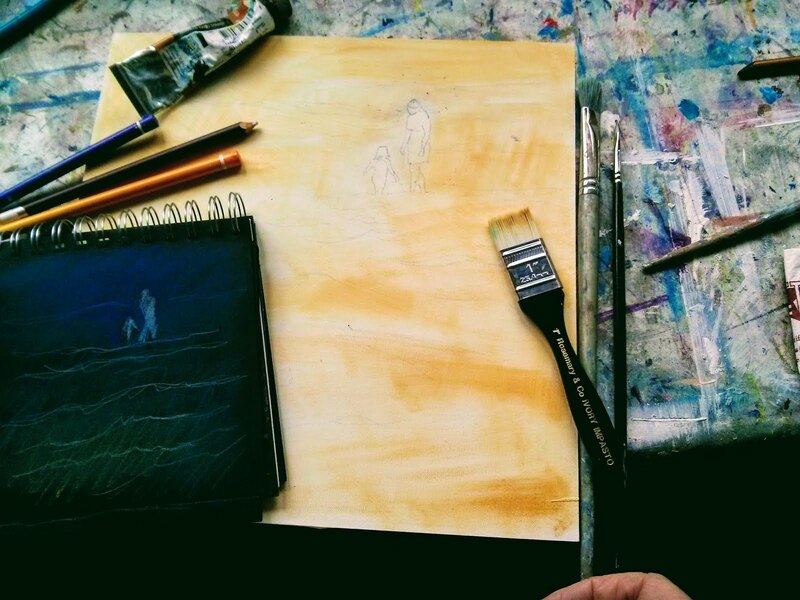 They're all off living their own lives, which if truth were told gives me time to paint. For some reason much of my art has taken inspiration from the coast. 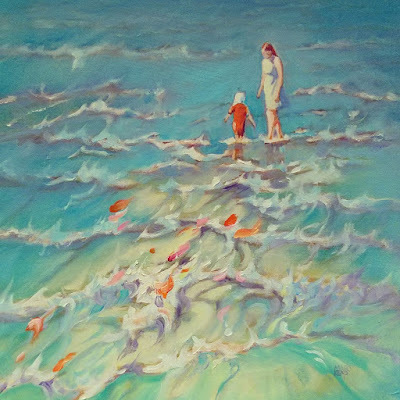 After all every bit of life is there or somewhere close by, whether it's on the beach itself or in the sea or the wonderful seaside towns and villages, sometimes very refined, often not! 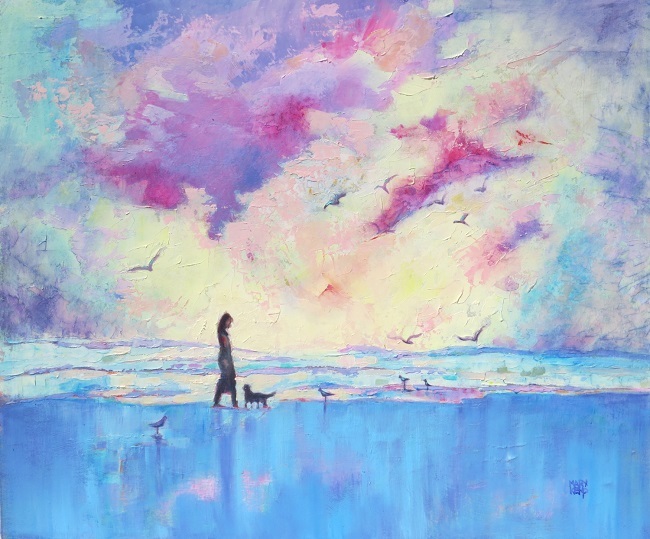 I paint a lot of dogs, and love their free spirits just like children on the beach. Perhaps that why I paint them. 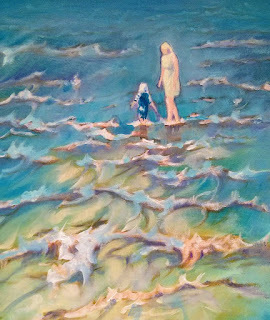 This painting is available now online, and in time for Christmas I have also produced a print of it which if you use your SEASIDEFRIENDS discount code gives you a 15% discount. I love the feeling I get when I discover something new and exciting while I'm browsing a site that I love. As you might have guessed I'm a big Etsy fan, and coming up to Christmas it's full of all sorts of enticing goodies. I popped "Border Collie" into the search engine, (as you might have gathered I'm a big border collie fan too) and here are some of the wonderful things that came up. I hope you enjoy them. 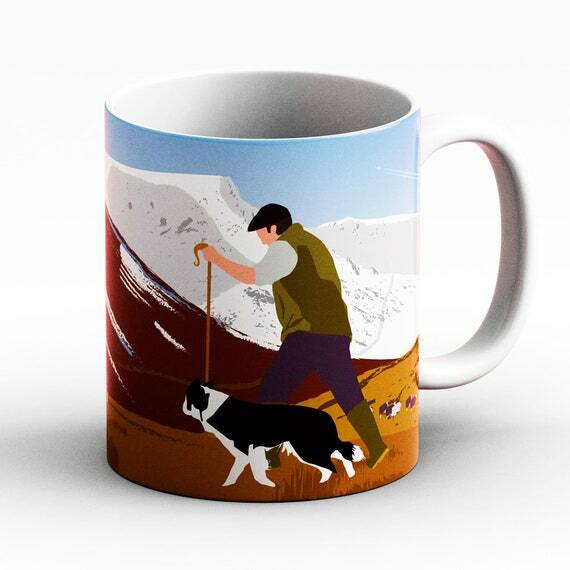 First I saw this unusual mug, with a border collie doing what border collies do best, going for a long walk in wild open countryside. My second discovery was a rather smart tote bag, just the thing to carry those little treats home in! 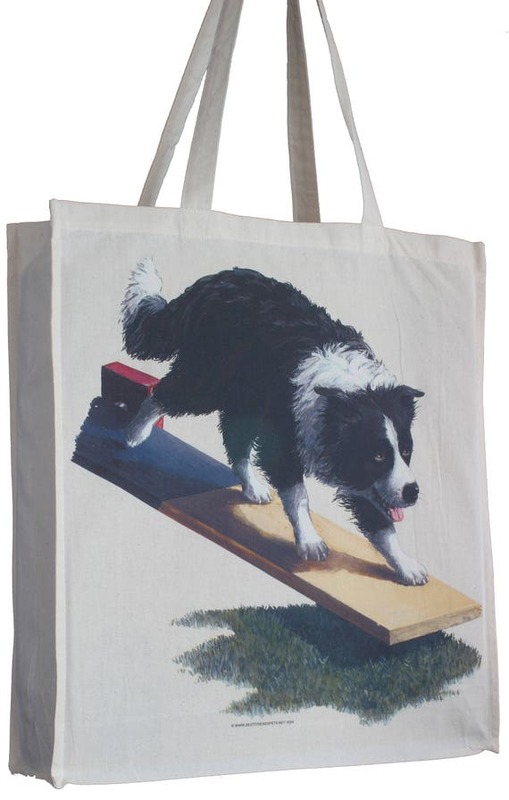 This is made by Tailzgifts and is called an Agility Border Collie Shopping Tote Bag. They have lots of doggy type gifts. I couldn't let a winter, nearly Christmas, round up go by without including a cross stitch. There's nothing like a long evening with a sewing project on your lap while you snooze over the television. 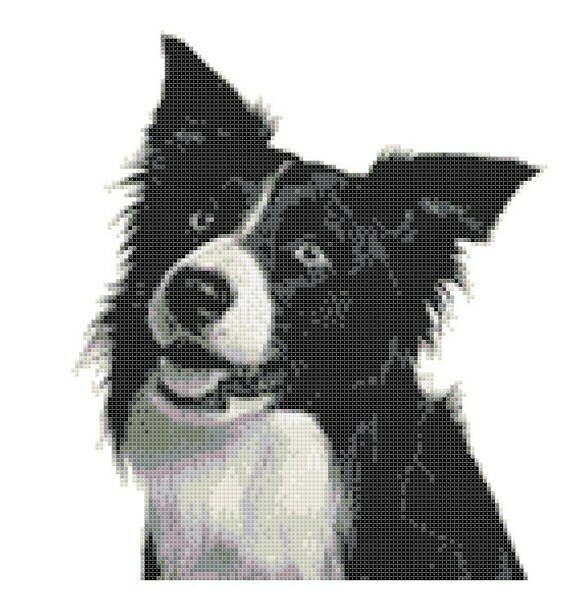 I've found a lovely border collie for you in counted cross stitch. 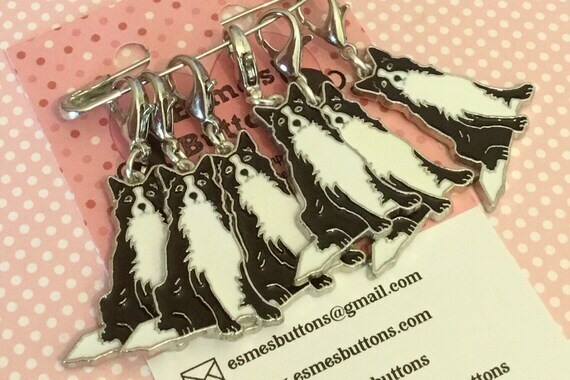 My next border collie find I think is a bit niche, but they were so cute I just had to add them. They came up when I was looking at cross stitch kits. I looked at a lot of T shirts. Etsy explodes with T shirts with every possible image you could think of. 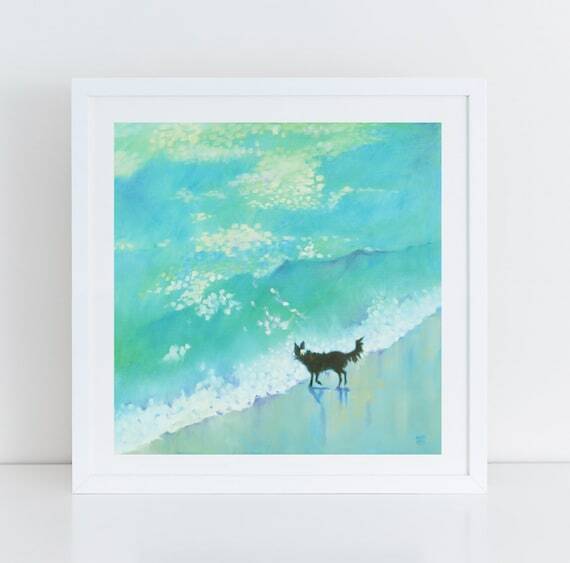 But in the end I chose a very simple understated design with a rather winsome border collie looking out at me. 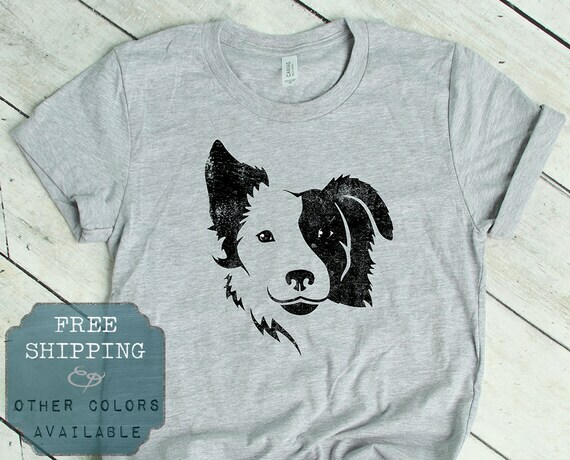 And really I know you're dying to see what my border collie offerings looks like on Etsy. I have a lot of border collie paintings and prints there, because my son's family owns the lovely Grace, a border collie with a lot of energy, and she finds her way into much of my artwork. Check out Etsy, it's full of great stuff. Oh, don't you just love autumn! 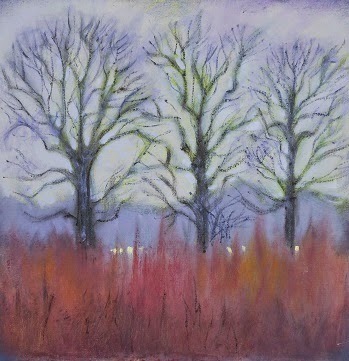 I revel in it's misty mornings and trees exploding into colour. There's conkers and baked potatoes, not to mention wooly jumpers, and for the knitters amongst us a new project in heather coloured wool to accompany all that telly watching. It's just a shame it has to lead to winter. It's very difficult for me not to reach for the blue. 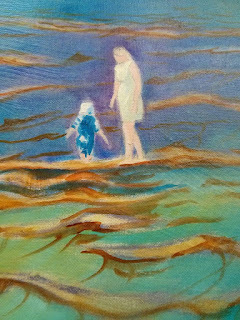 Sometimes I have to consciously decide not to use blue because before I know it everything is cobalt or cerulean or ultramarine. 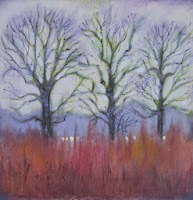 "Three Trees in a Russet Field"
And should I include my all time favourite autumn painting, from many years ago? Check out my SHOP for available paintings. 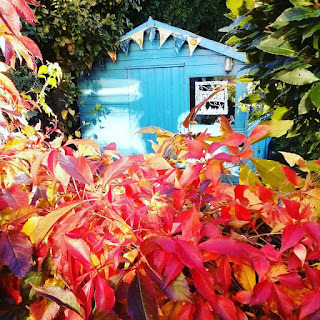 Happy autumn to one and all! I sold this painting earlier on in the year and because, unusually I recorded how I painted it, I wanted to share it with you. Like a lot of artists I know, my head is always full of pictures, and it's very difficult when you think in pictures to put your ideas into words. 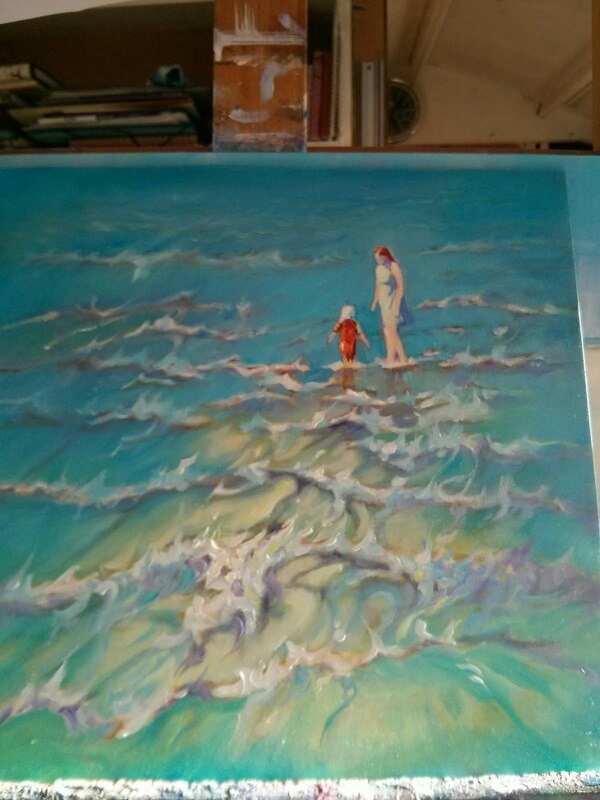 I took a photo of one of my granddaughters paddling in the shallow seas of the Norfolk coast. She was surrounded by water, with poised self sufficiency. So much so that I wanted to translate her pose into a painting. Without further explanation here is how I painted this picture. Quick sketch and transparent raw Sienna ground. Cerulean blue and cobalt blue sea. Getting to grips with the figures. 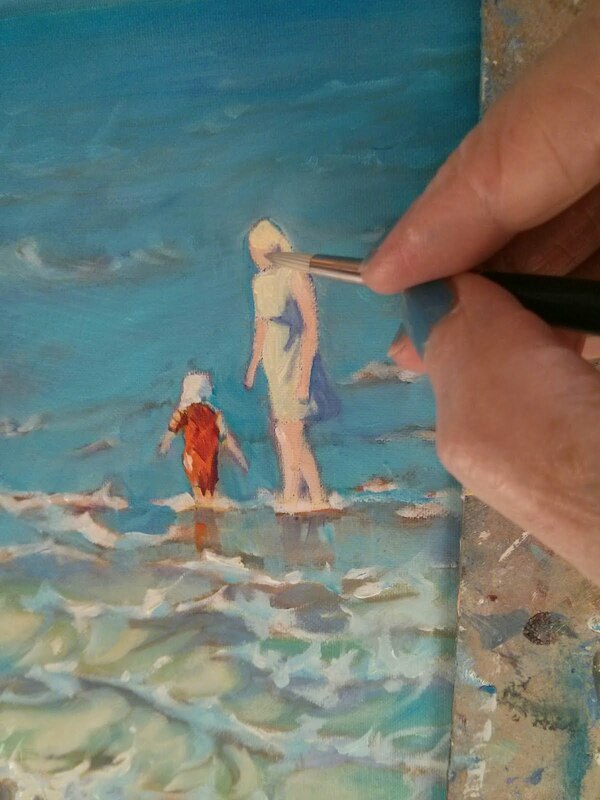 Detail and colour on figures. the feel of the picture completely. Open Studios. 7 Tips for Success + Extras Now it's Getting Close. 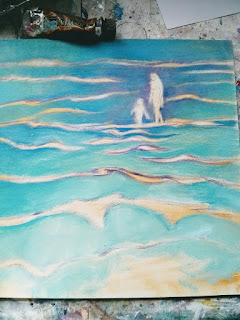 I love to share my art, but copyright of my art remains with me and unauthorised copying or use is prohibited.